In an age when evangelical chicanery and doctrinal downgrade pummels the church with its flourishing absurdities, many of us find shelter in those old doctrines known as Calvinism. For those of us who hold to the old truths of Paul that weaved their way through the Reformation and ironically came to be known as ‘Calvinism,’ it has become an anchor in tepid squalls of what is otherwise a storm of theological insanity. Unfortunately, we’ve come to take for granted the granite foundations of our monergistic faith, and have started to use “Calvinism” like a sprinkling of salt on an otherwise rancid cut of pork. A little heresy here, a little heresy there, sprinkle on some Calvinism and suddenly the unseemly becomes digestible. A growing number of heterodoxical hucksters call themselves by the name Calvinist and pair their novel dogmas with Calvinism in the hopes that it will be more respectable and go down the evangelical esophagus a little smoother. And frankly, the Calvinism-heterodoxy combination is a tasty cocktail and people swallow it. After all, how heterodoxical can it be, if it’s wed with Calvinism? Such a strategy couldn’t have worked before Calvinism became cool over the course of the last decade, but now Calvinism is in vogue, and it’s being used to accessorize all kinds of nefarious teaching. Single-issue discerners then fall for it hook, line, and sinker. In perhaps no other place is this sprinkling of Calvinism on heterodoxy more noticeable than in the Island of Doctrinal Misfits occupied by denizens known as Charismatic Calvinists. It’s here that a mingling of self-contradictory doctrines come to meet one another and dance with the devil, blissfully unaware of how spectacularly mismatched they are as companions. The polemicist who’s aware of their basic heresies should shudder at the term Charismatic Calvinist the same way they should shudder at the (yet to be invented, but probably not too far off in the future) term Arian Calvinist or Sabellian Calvinist. That may seem like hyperbole, but I’ll remind you that this island of misfits already includes Conditionalist Calvinists, Universalist Calvinists, and Vinist Calvinists; stranger things have happened. Calling yourself a “Charismatic Calvinist” doesn’t make your Charismaticism better, it only makes your Calvinism worse. There are as many definitions of Charismaticism as there are nonsense word-fragments babbled in your typical private prayer language (about 4-6) and they are repeated almost as frequently. But for the case of this short treatise, we’ll consider the definition provided most naturally by the etymology of the term Charismatic. The word comes from the Greek χάρισμα (pronounced anti-climatically as charisma) and means “grace gifts.” Its application, however, is directed towards not all gifts of the Spirit, but particularly the gift of “tongues,” prophecy (IE direct, divine revelation) and the gifting of powers for healing and working of signs and wonders. A Charismatic today, therefore, would be one who believes in continued direct, divine revelation, the gift of tongues, and the spiritual gifting to specific individuals to work regular healing and signs/wonders. There is a more simple, but synonymous term, however; Montanism. Montanism – also known as the “New Prophecy” – was a heretical teaching that developed during the late 2nd century by a demonstrably false teacher known as Montanus. Although this treatise isn’t designed to give an in-depth look at the various ways in which modern Charismaticism is almost identical to ancient Montanism (read the transcript from Modern Day Montanism or watch the video for that), suffice it to say that the basic gist of Montanism was the claim that God was continuing to give new prophecies and continuing to speak through direct, divine revelation outside the Holy Writ. It didn’t help the Montanist standing in the early church that they also were egalitarian (letting women preach), spoke gibberish nonsense words, and had ecstatic fits and generally practiced unabashed mysticism (if that sounds familiar, you’ve been watching TBN). The Montanists were roundly and soundly rejected by the Church Historic, were anathematized at the Synod of Iconium and utterly rejected by the bishops of the early church who almost universally condemned them in open, signed letters. Early polemicists, like Eusebius, were even harsher on these heretics and despised them with the burning passion of a thousand lit Servetuses. The Church Historic eventually confiscated Montanist meeting houses and burned them down, eventually killing their leaders and massacring their remaining followers. While our forbearers might have gone “full-Calvin” in their treatment of heretics, there was no doubt that they considered the Montanists to be heretics. The one notable exception was Tertullian, who for whatever reason had a soft spot for the Montanists despite not believing in their “excesses.” While not even Tertullian’s influence could soften the church’s treatment of the heretics, it did lead more people into that error. If the modern Charismatic-Montanist comparison stands (and it does), we might put otherwise sound teachers (like Matt Slick, Wayne Grudem or John Piper and other “cautious charismatics”) into the role of Tertullian, whose good-natured naivety got the better of his judgment and inadvertently led more people into error. While any good Calvinist should affirm that the Scripture alone is “the only infallible rule of faith and practice” (which comes from the same chapter of the same historic Confession that affirms Cessationism), we affirm Sola Scriptura rather than Solo Scriptura. Whereas we (speaking for Calvinists of the Reformed tradition) ardently affirm that the Scripture alone is the only infallible rule of faith and practice, we do acknowledge that the Scripture is not alone (read that statement twice if you need to). Accompanying Scripture – as a non-infallible but very important guide – is historic theology. In fact, without a high view of historic theology, it’s nearly impossible for a polemicist like myself to adequately or authoritatively diagnose anything as heresy or orthodoxy. One would be hard-pressed to argue – as consistent adherents of Solo Scriptura do – that church history doesn’t matter. Decisions made by the Church Historic certainly matter to us Calvinists when we are dealing with the heresies of Arianism, Sabellianism, Docetism or other damnable teachings. Many modern day Tertullians like Slick, Grudem or Piper might reference Nicaea with near veneration, but pooh-pooh the very same Church Historic that cast Montanists to the same Isle of Anathema as non-Trinitarians or even our Calvinist arch-enemies, the Pelagians. I recognize that when people call themselves “Calvinist” they refer primarily to the five-pointed soteriology of John Calvin, and not necessarily to his theocratic advocacy for killing heretics, his paedobaptism, his sense of humor or even his eschatology. Nonetheless, if someone is going to call themselves a Charismatic Calvinist, it might be a good opportunity to see what John Calvin thought about the cessation of the Apostolic Sign Gifts. The Spirit, Calvin claimed, was not promised to give us new revelations, but to seal our minds on the very doctrines explained and examined in the Sacred Writ. When you read Calvin’s comments in that section of the Institutes, you can only imagine what his derision would be for the modern Charismatic movement. Calvin was particularly incensed at the notion of continued Apostolic-level signs and wonders. He was repulsed at the notion that continued signs and wonders or direct revelations was to be expected or even accepted, as the Catholic Church taught with their claims of mystic power. The gift of healing, like the rest of the miracles, which the Lord willed to be brought forth for a time, has vanished away in order to make the preaching of the gospel marvelous forever…. One could spend from now until eternity citing Calvin on his antipathy toward Continuationism, and nothing could be written to fully refute it except for an occasional myth or legend propagated by Montanists regarding his possible closeted super-secret Charismania (to be catalogued in the chamber of silly legends, along with copies of The Da Vinci Code and the Mystery of the Shemitah). But this leads me to the next point. A common trait among charismatics is that they have a tendency to believe silly things. As I’ve outlined ad nauseam in my body of work, the lack of discernment among the charismatic community regarding believing patently silly things is near proof-positive that the Holy Spirit, who distributes discernment as a spiritual gift, is not at work among them. Unfortunately, this trait seems to accompany even those who sprinkle their charismaticism with a dash of Calvinism. In a desperate attempt to find someone somewhere who has demonstrated the sign gifts in the last nineteen-hundred years of church history, a few far-fetched accounts are glommed onto, exaggerated and inflated to make it appear that stone-cold cessationists might have had a closet charismatic streak. The post-mortem claims regarding John Knox is one such example that is used commonly. Quoting from resources 300 years after his death, John Howe in The Scots Worthies makes several claims regarding Knox’s alleged imprecatory “prophecies” about the violent deaths of several tyrants. If valid, let it be of no surprise that tyrants regularly come to violent deaths, particularly those tyrants who oppose God. Let it also be noted that several Montanist prophets today correctly predicted the rise to power of Donald J. Trump to the American presidency. This is a standard of proof that is uniquely and laxly accepted only by those desperate to lay hold of some Saint who might have demonstrated the gifts that they claim today are active but lack so abysmally any demonstrable evidence for. When great men pass on, stories of their exploits and spiritual power grow with all the restraint of one of Grimm’s Fairy Tales. In fact, they don’t even have to die for the tall tales to start. 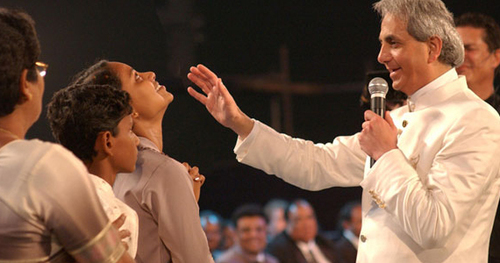 Did you know that John MacArthur once exorcised a demon from a woman by sneezing in her direction? Also, Paul Washer once had a man interrupt his sermon with snoring and he set the sleeper on fire by glaring at him. It should come to no surprise that after a man lay buried, people tell stories of their special spiritual prowess. Do not believe old wives’ tales, even if they’re about your favorite Reformer. Charismatic Calvinists have a tendency to search for the Missing Link between Montanists and the Reformers like little old charismatic widows search for healing in the late-night infomercials of Peter Popoff. It’s very unbecoming of a Calvinist. I know it seems contradictory, but most Charismatic Calvinists are cessationists, at least inconsistently. These include our Tertullian-tempted friends Slick, Grudem and Piper. As Charismatic Calvinists cry out, “Prove it from the Scripture,” Reformed Calvinists might remind them of their inconsistency when it comes to Scripture interpretation, scriptural deduction, and doctrinal formation. If the burden of proof required to adopt Cessationism is a verse that says “the Apostolic Sign Gifts will cease in the year 131 AD, in the month of March, on the 4th day” then they require a burden of proof that far exceeds that which they use to defend doctrines like the Holy Trinity and the TULIP. Certain things – like the Trinity – are scripturally deduced. To make scriptural deduction somehow unworthy of Christian consideration, we lose some very essential Christian doctrines. So then, the Scriptural deduction regarding Cessationism goes something like this (consider this a crash course in Cessationism): There were certain spiritual gifts given to mark a true Apostle (2 Corinthians 12:12), to substantiate their message and authority. These Apostolic-related gifts were not altogether different than the type of signs and wonders demonstrated when God handed down the law to Moses and when God handed down the rest of the Old Testament through the prophets. Like the miracles of the Exodus period and like the miracles of the prophets, the miracles (or signs and wonders) of the Apostles were also meant to validate new Scripture being given. The ability to prophesy revelation and work signs and wonders was for the Apostles and in certain cases, those anointed by the Apostles by the laying on of their hands. As the Apostles died and the generation they ministered to died as well, the Apostolic sign gifts ceased, as the canon was made complete as the Gospel was fully given. That’s Cessationism in a nut-shell. Now, whereas Charismatic Calvinists demand a specific verse that lays out a date and time for the accomplishment of these things, they (by and large) embrace whole-heartily the cessation of the Apostolic office. Apostles are a spiritual gift to the church (Ephesians 4:11). Our Tertullian-tempted friends deny the current existence of the Apostolic office, and wouldn’t for a second consider the claims of the New Apostolic Reformation. To put it plainly, our friends Slick, Piper, Grudem et al hold to a form of Cessationism. They believe the gift of Apostleship has ceased, and they came to that conclusion through scriptural deduction (there is no verse that says the Apostolic office will cease), and we applaud them for it. Reformed Calvinists, as opposed to Charismatic Calvinist, are merely consistent in our scriptural deduction; if the Apostolic office has ceased, the Apostolic gifts that demonstrated the validity of Apostolic authority has ceased. Embracing the possibility of continued revelation is effectively the very same as entertaining the possibility that the canon is not complete. It is for this reason that Montanists were removed from the church, and it is for this reason – a tacit attack on the sufficiency of Scripture – that Montanism should be repudiated today. The vast, vast majority of Calvinist leaders in the Church Historic would denounce the notion of continued revelation with ferocious conviction, and we should as well. Matt Slick has provided invaluable resources that expose cults and sub-Christian sects. Don’t take this criticism as being a repudiation of his ministry, which has been personally beneficial to me and for which I am personally thankful. The same, I’m sure by many, could be said of John Piper and Wayne Grudem. “Institutes of the Christian Religion.” Institutes of the Christian Religion – Christian Classics Ethereal Library. Accessed November 29, 2016. http://www.ccel.org/ccel/calvin/institutes.iii.x.html. “John Calvin On The Reformation’s Lack of Miracles – The PostBarthian.” The PostBarthian. 2013. Accessed November 29, 2016. http://postbarthian.com/2013/01/28/john-calvin-on-the-reformations-lack-of-miracles/. John Calvin, Institutes of the Christian Religion, 1536 Edition; pg 159. “Jonathan Edwards on the Cessation of Revelatory Gifts.” Reformation Nigeria. 2011. Accessed November 29, 2016. https://reformationnigeria.wordpress.com/articles/johnathan-edwards-on-the-cessation-of-revelatory-gifts/.